This time last year I said yes to curiosity and allowed it to take me where I needed to go. I’ve spent a lot of time interrogating myself, and curiosity has taken me to places in my soul I never expected. I jumped into curiosity, never considering how in the world I’d ever get back to where I was before. But I guess that’s the point, isn’t it? Once we go down the path of curiosity, we can’t come back. We may retrace our steps, but when we do we are not the same. Wow! No forewarning. No gentle introduction. No shallow say-hello-give-a-fake-smile-and-platitude-and-move-on moment. The shocked look on her face indicated that I may have been just a little bit more open than she expected! The rest of that day I was curious. Curious about where that comment had sprung from. I’d been feeling angry. Frustrated. Uninspired. Unsure. But why was I afraid? Since then, I’ve risked vulnerability and sucked up the courage to allow curiosity to take me places I didn’t want to go. Curiosity has only led to more questions. More self-interrogation. More adventures of the soul. I read a LOT, and as I read, curiosity took me to new places, confronted me with new ideas, new possibilities and even, new beginnings. Rising Strong by Brené Brown, Big Magic by Elizabeth Gilbert, What We Talk About When We Talk About God by Rob Bell and The Artist’s Way by Julia Cameron have been partners and guides to my curiosity this past year. Conversations with all sorts of people, in all sorts of places, have been paths to even more questions and drawn me deeper down into the rabbit hole. Curiosity is a paradox. It’s about accepting things, but always learning and growing. I have my core beliefs and values, but I also have a desire to never stop questioning. 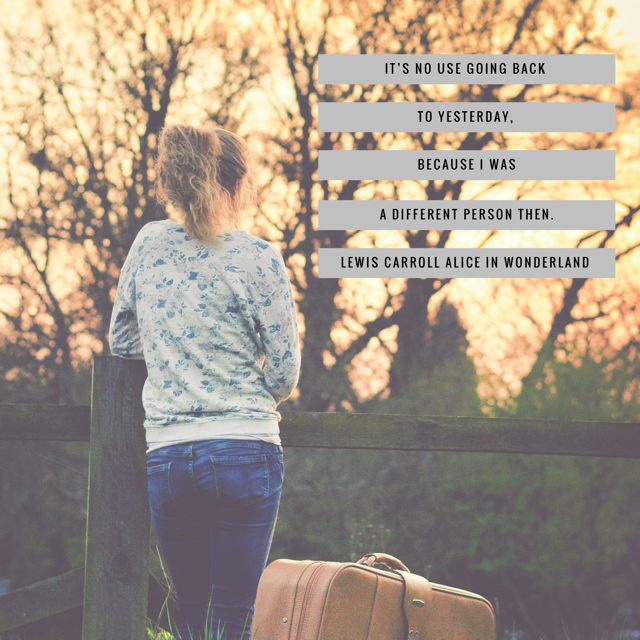 A year on, like Alice, I’ve realised that it’s no use going back to yesterday because I was a different person then. This Article was originally posted by Kin Women. You can catch Kin Women every Tuesday on Brekky with Kriste and Morro at 8:40am.